Victoria is cold on the Liberal Party – what can they can do about that? The state government of Victoria lost power this weekend. The election saw their narrow majority reversed, and by losing government after just one term in office, they set a record. No other government has done that since 1955. 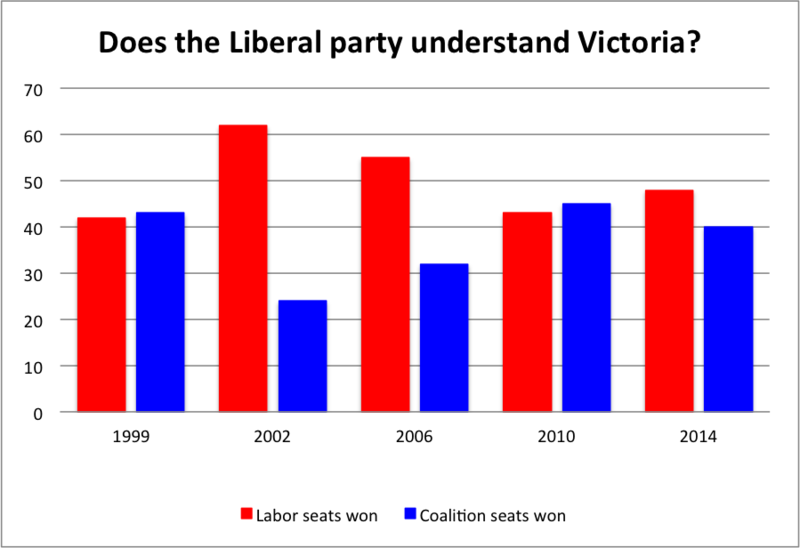 Since Jeff Kennett’s reign as premier from 1992 to 1999, the Coalition’s appeal to the electorate has been slight. They’ve lost elections in 1999, 2002, 2006 and 2014, some by big margins. They won in 2010 by just two seats. The state is lurching away from the Coalition. (The Coalition is an alliance between the large city-based Liberal Party and the smaller, country-based National Party). The Liberals can console themselves with a decent-looking result in first-preference terms (766,000 votes to Labor’s 820,000 on the count so far). But there are plenty of voters that do not put Labor first whose vote ends up with them thanks to the magic of preferential voting. The Liberal party do not have an equivalent. The Nationals operate mainly in different areas to the Liberals and are in any case a smaller, less popular party. 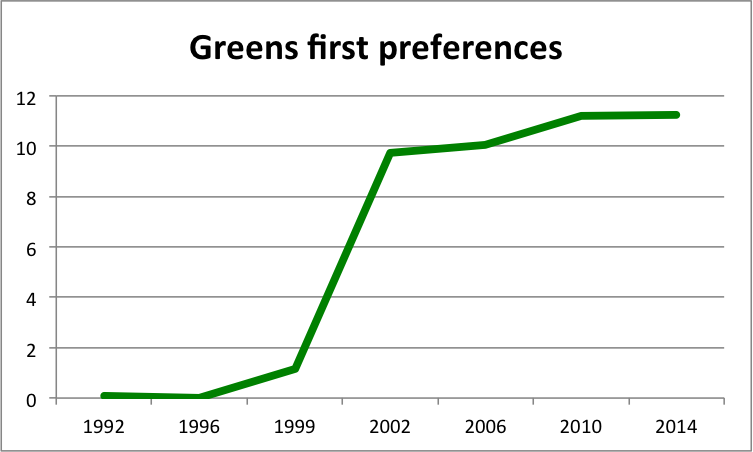 The Greens took 11.2 per cent of the vote in 2014, to the National Party’s 5.6 per cent. The whole state is lurching away from the Coalition. It’s not just the Greens. The National party are losing seats to Independents all over the bush. Faced with this remarkable recent record of underperformance, The Liberal party can either follow the population or fade into irrelevance. They need to tack to the centre to become believable on key issues for voters at state elections, like schools, transport and hospitals. The choice of a new leader will be essential in remaking the party. In some ways, the selections on offer look good: An man in his 30s of Ukrainian descent or a prize-winning lawyer known for his pro bono work . But Matthew Guy is a former staffer to Jeff Kennett and an unpopular planning minister while Michael O’Brien is a former adviser to Peter Costello. These two are the front-runners for Liberal leadership. If you keep building a new house out of the same bricks, there’s a limit to how much better you can make it. And when you can narrow down your field to two senior cabinet ministers so soon after a crushing defeat, it indicates a “steady as she goes” attitude. Perhaps the Liberal party is unable to reform itself, and the voters will have to do it for them. Previous Previous post: The most important question in our economy: Why will we invest in housing but not business? Next Next post: There has never been a better time to kill negative gearing.